Over at Double Delight the challenge is to POP IT UP, that's right use dimensionals to pop up all or parts of this image. If you played last week you would have gotten Cluck for free, if not then you can find him over at Faith's Designed2Delight digital stamp shop. I popped up all of Clucks body and than partially cut out the wing and curved it. I also use flower soft to give it a little more dimension. 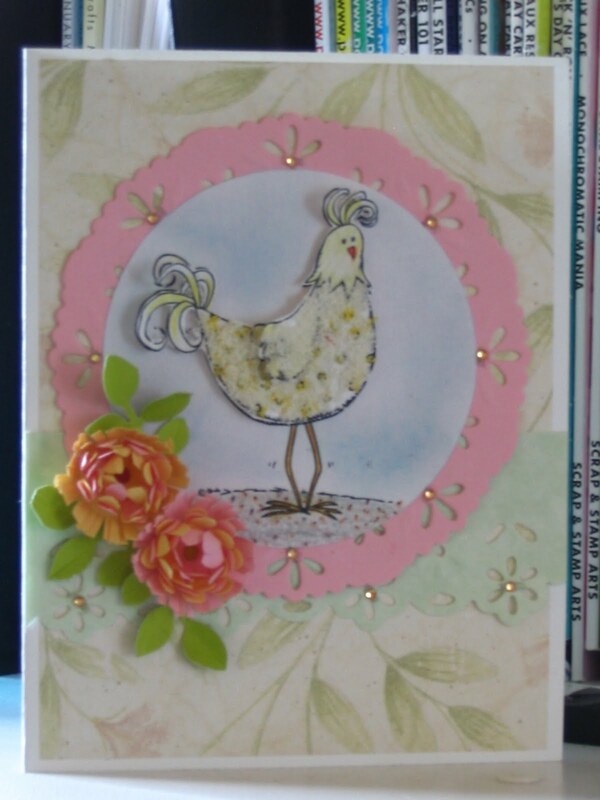 This card will also be entered into Paper Sundaes challenge, where you are to make your own flowers. They are being sponsored by Lili of the Valley this week, go check them out here! OH WOWIE!!! I am LOVING your flower soft chicken! *Ü* That really gives him a soft feathery look--fabulous job! Love your soft colors of DP and your flowers are gorgeous!! Thanks so much for playing along at Double Delight! Oh, this is gorgeous! 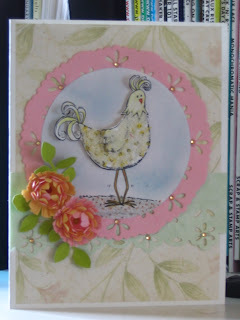 What a fabulous bird, and the homemade flowers are so pretty :-) Glad you played along with us at Paper Sundeas! Very pretty! Love your chicken! And your flowers are wonderful! Thank you for joining us at the D2D Artist's Challenge this week! Love the flower soft on the chicken, looks just like feathers. Your flowers are beautiful, too. Great card.